Hannah waited mere feet from the prophet of Israel, shaded from the Jerusalem sun by the sprawling branches of a tamarisk tree. Sweat beaded beneath her head covering, a result of the mid-summer heat, her nerves, or both. A crowd hung back, blocking the Horse Gate and lining the city’s massive stone walls. They had come to see the man of God heal the lame and the cursed. Hannah bore a curse since birth. For seventeen years, she had been unable to taste or smell. Her ears were but a flap of skin with no slope, no lobe. Her father said it was a punishment from God for an ancestor’s crime. As the chief priest, he should know. She grasped her father’s velvet robe as the prophet’s hands slid over a young boy’s leg. The boy had lain in his father’s arms not two feet from Hannah and her father and brother, his limb nothing but a boiled bone with skin. She shook with anticipation as she witnessed sun-toasted flesh, fat as a baby’s cheek, grow on top of the boy’s decomposed leg. What will it feel like when the prophet touches my nose, my lips, my ears? She fought to keep her composure. I am a disgrace. Shrieks of “Jehovah Jireh” sliced the arid breeze. “God has healed me,” the boy shouted. He jumped on his re-birthed leg, arms flapping as if to fly away and leave the hardened ground behind. Hannah stifled a gleeful laugh. She delighted in the boy’s ecstatic dance. Trembling, she dropped to her knees before the prophet and beheld his weathered face. Hannah hesitated. Her father had forbidden her to speak of the curse. Her hair and head covering had hidden her deformed ears. She glanced up for her father’s permission. He gave her a reassuring nod. Her back straightened, but she continued to concentrate on the prophet’s aged face. The man of God ignored Shimron and cupped her jaw. His thumbs caressed her cheekbones, her ears, and stroked to the bridge of her nose. Hannah closed her eyes. Her body went weightless under the prophet’s touch, almost free from her burden. She dreamed of things the warm breeze would blow her way—a woman’s perfume, the stench of the unwashed. Things she had only heard of before. But nothing came. The prophet’s fingers stilled. He drew back from her. Surely she should feel something? A burning on her tongue? A tingling in her nose? A tickling in her ears? She prayed for pain. “It is not her time,” the man of God said, his voice steady, yet quiet. Stunned, she sat back, bracing herself so she would not collapse further into the dirt. Hannah drew to her full height at her father’s declaration of innocence. The attention of the people centered on her and on her family. Sweat trickled down her arm. “And so you should,” the prophet answered. He glanced at Hannah. She clutched her brother’s hand and withdrew it from the man of God. “You healed the boy,” she said with rushed breaths. The prophet’s anointed-one stare twisted her stomach into a weaver’s knot. “The power and timing do not belong to me.” The righteous man turned from her. His regal gait parted the crowd. Trailed by a servant, he headed away from Jerusalem. The muttering of the crowd grew louder. Hannah’s cheeks warmed as if she were bending over a cooking fire. She noticed all the curious people studying her. They know something’s wrong with me. How could her mother deny the gossip with all these witnesses? Hannah turned to find her father and brother discussing her, their faces close, their words terse. The crowd shifted forward to hear the conversation between the angry, insulted priests. Their glances condemned her. Their judgments slandered her mother. Her composure crumbled. She lifted the hem of her tunic and raced toward the city gate. “Leave me be,” Hannah cried. She pushed a woman out of the way and fled down the nearest street. Her sandals thudded against the dirt lane as she dodged oxen and carts and merchants. Her chest burned as if the dust particles she breathed were embers from a blacksmith’s fire. Her father should not have taken her to the prophet. He should have accepted her fate. She was cursed. A vessel of sin birthed from the past. She looked over her shoulder to see if anyone pursued her. Selah! No one did. Linens hung by the side of the road, drying in the heat. She slipped behind a cotton shield strung between two buildings, creating a small alcove. She hid by a fat rain barrel and tried to calm her breathing, but the pressure behind her eyes caused her chest to cave even deeper. Supported by the wall of a stranger’s home, she buried her face in her knees. What would her mother say to the holy man’s refusal? Footsteps crunched against the ground, coming closer to the linen wall. Was it her father? She wrapped her arms around her knees and pulled her legs tight to her body. The curtain whipped back. Sunlight blinded her. Blinking, she focused on a young man, his turban barely able to contain his wild, curly black hair. His eyes widened and he rubbed his bearded jaw line, giving himself an imaginary shave with his finger. Hannah leaned backward into the clay bricks of the wall. “Don’t touch me,” she warned. Her throat tightened from the run and the erratic beat of her heart. “Mostly here.” The man rose slowly and pointed to an area between the barrel and some crates stacked in the corner. “Not inside?” She glanced up the stone wall to a window above them. Hannah’s spine flattened against the wall. She surveyed the dark-haired intruder’s face in case she would need to recall him later. He looked not much older than she. Dark brown mischievous eyes stared back at her, sparkling as if he had captured the glow of the moon he slept under. Did he think she had money to steal? Or worse, would he take her virginity? She glanced at the sheet billowing in the breeze, hiding them from sight. Could she race fast enough back to the street? She slid a ruby bracelet under her sleeve. It was to have been a gift for the prophet when he had healed her. There was no need to tempt this man with gold and gems. “What?” The hospitable offer of food shattered her thoughts of escape. He rummaged inside a sack tied to his belt and offered a pomegranate. “Sit and share with me. Looks like you could use some.” He carefully removed a carving knife from the woven bag and sliced off a piece of the honeycombed fruit, revealing bright red berries. She ignored his insult and watched his blade, anticipating any move in her direction. He skillfully sheathed the knife with one hand and shoved it back into his sack. “Go on, take it.” He inched the fruit closer to her mouth. “Then I shouldn’t take it from you if you are allowed to glean with the poor,” Hannah said. This may be the only food he has all day. Hannah glanced at her wrist. Scarlet gems sparkled at the edge of her sleeve. The bracelet hadn’t stayed hidden. Why couldn’t anything go right today? In an instant, he reached out and brushed the pomegranate against her lips. Flinching, she bumped her shoulder bone against the wall. “You touched it. Now eat.” He tilted his head and grinned as if he dared her to challenge his hospitality. She hesitated, rubbed her arm, and accepted the fruit. Slumping next to his bag, he leaned into the wall and kicked out his legs. His fingertips pursued the pomegranate’s berries. Hannah eased down the wall and sat near him. The man’s closeness caused a tingling along her side and in her belly. It had been years since a stranger ate next to her, touching her, sharing food. She let the fleshy seeds roll on her tongue. A squirt of juice washed over her taste buds. It might as well have been water. She nodded and smiled to encourage his generosity. No need to explain her condition. “Gil. Gilead when my mother has need of me and calls down the street.” He mimicked his mother’s voice. “Hannah!” The boom of her brother’s voice rattled down the lane. She jumped up, heart racing. For a brief moment she considered staying put, but then thought better of it. Hannah nodded and then dodged around the linen barrier. “Me,” Gil said, stepping forward. His arched back broadened his shoulders. Her brother’s glare raked over Gil. “He is filthy. Has he kept the ceremonial laws?” Her brother shook the fruit from her hand. Dirt coated the saliva-soaked peel. “Not much,” her brother jeered. Pain pulsed down her arm from her brother’s grasp. He hurried her up the street. When she looked back, Gil had started after her. There was no more moonlight in his eyes. Gil glanced at her brother and then handed her the dropped fruit. Hannah met Gil’s questioning gaze. No denial formed on her lips. Her boldness withered under the burden of her shame. If I was healed, I would be worthy. Her brother turned and took hold of her anew, pushing her up the street, chastising her for being disobedient. Does he mean me? She hesitated and nearly stumbled. Flailing a hand behind her back, she tried to keep Gil silent. Please listen. Do not add to my misery. Tears welled in her eyes. She fisted her hand and thought of the miracle she had witnessed, of a boy frolicking in the dirt. She wanted to be free from the scorn of her family. To enjoy a meal with a welcoming neighbor. To pull her hair into a braid and dangle earrings from perfect lobes. The prophet had to return to Jerusalem soon. Surely he was needed at the temple. And when the man of God returned, she would seek an end to her curse and her humiliation. A humiliation the prophet had made public. 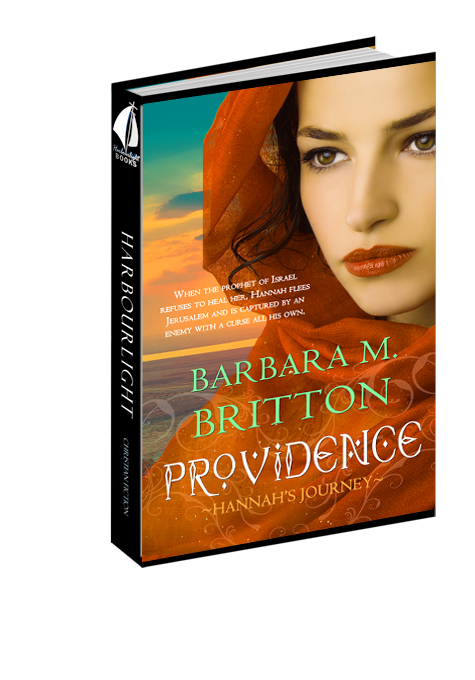 Question 1: Why did I title this book Providence? Answer 1: God is in control no matter how difficult our circumstances seem. Question 2: Hannah feels less than others. Have you ever felt this way and why? Answer 2: God creates everyone in His image (Gen.1:27). You are unique and special. God also gives spiritual gifts to His children. Go around the room and share the gifts God has given each and everyone one of you. Question 3: Should Hannah have left her home and her parents? Question 4: Why did Gil accompany Hannah? Answer 4: Gil's mother had been abused in the gleaning fields. He wanted to protect the weak as a gleaning field protector (Ex. 22:22). He sought justice and healing for Hannah, and of course, he liked her too. Question 5: Have you been in any scary situations? How did you get through them? Answer 5: Hannah and Gil relied on their faith in God. They prayed to God, reciting the Shema often for comfort (Deut. 6:4-6). They also found strength in each other. Question 6: What was your favorite scene? What was your least favorite scene? Share why. Answer 7: There are many Cults, but anything that keeps us from spending time with God can be a false god. How much time do you spend on social media and technology in relation to the time you spend in prayer or Bible reading? What about your job? Do you seek money and status more than God? Question 8: Why do you think Janelle and Naabak went to Israel to see the prophet? Answer 8: They saw the strength of Hannah's faith and her conviction that God can do anything. Hannah told them of the healings she saw in Jerusalem. Her convictions never changed. Question 9: Do you have a Konath in your life? What can we do when we encounter difficult people? Answer 9 God tells us to pray for those who persecute us (Matt. 5:44). You don't have to pray alone. Mention your situation to parents, pastors, and friends and have them pray for you. Sometimes we need to take action to avoid a dangerous person. Bullying is never acceptable. Do not suffer in silence. You are a unique and special creation of God. Question 10: In what ways can we be a light to others and show them God's love and faithfulness? Answer 10: Be prepared to share your testimony with others (I Peter 3:15). Invite friends to church, VBS, or a special event that tell about Jesus. Pray for people to come to know God as their Savior and Lord. Shine your light for others to see.